Despite advances in transfection reagents and methods, there are still a number of cell lines which are difficult to transfect, such as T47D mammary carcinoma cells. Using a ß-galactosidase reporter plasmid, the transfection of T47D cells with FuGENE® HD Transfection Reagent has been optimized. Using a variety of FuGENE® HD Transfection Reagent-to-DNA ratios, we have shown through RT-PCR and ß-galactosidase enzyme activity assays that FuGENE® HD Transfection Reagent is able to transfect this cell line with high efficiency. Manipulation of gene expression in cultured cell lines is central to molecular biology. Most cell lines of epithelial origin are relatively easy to transfect through a variety of methods (e.g., lipofection or calcium phosphate). But there are a number of cell lines, such as mammary T47D, which are hard to transfect by traditional methods. We have optimized the transfection of these cells with FuGENE® HD Transfection Reagent, a reagent specifically designed for the transfection of so-called hard-to-transfect cell lines. A ß-galactosidase reporter plasmid was used to test the efficacy of FuGENE® HD Transfection Reagent in transfecting both T47D (ATCC® HTB-133) and MDA-MB-231 (ATCC® HTB-26) mammary carcinoma cell lines in a number of different conditions. For RNA extraction subsequent to transfection, 500,000 cells were seeded into 6-well dishes and left for 24 hours to attach. For ß-galactosidase activity assays subsequent to transfection, 100,000 cells were seeded into 24-well dishes and left 24 hours to attach. Both seeding densities resulted in approximately 80% confluency after 24 hours. Cells were transfected with a ß-galactosidase plasmid using FuGENE® HD Transfection Reagent at reagent-to-DNA ratios of 3:2, 4:2, 5:2, and 6:2. Additionally, samples containing either no FuGENE® HD Transfection Reagent or no DNA were included as controls. DNA was diluted in serum-free RPMI-1640 medium, in the case of 6-well plates to 100 µl per well and in 24-well plates 25 µl per well, and added to cells in full serum medium. 24 hours after transfection, RNA was extracted from cells using TRIZOL reagent (Invitrogen) as per the manufacturer’s instructions. RNA was quantified using Nanodrop. For RT-PCR, 500 ng of RNA was used per sample. RT-PCR was carried out using a commercially available RT-PCR kit. Even sample loading was assessed with ß-actin expression via RT-PCR prior to that of ß-galactosidase. RT-PCR programs to amplify ß-actin and ß-galactosidase in the samples consisted of 28 cycles with an annealing temperature of 52°C. Samples were run on 1.5% agarose gels and visualized using ethidium bromide staining. 24 and 48 hours after transfection, ß-galactosidase activity was assessed in the samples. Cell lysates were harvested after washing each well twice with PBS (pH 7.4). Then 50 µlof Promega 1x Lysis Reporter buffer was added to each well and incubated at room temperature for 15 minutes. Cells were then scraped from wells, vortexed, and centrifuged (2 minutes, 14,000 rpm). The supernatant was subsequently assayed for ß-galactosidase enzyme activity by adding 20 µl of lysate to 20 µl of an assay buffer containing ONPG. The samples were incubated for 30 minutes at 37°C or until a faint yellow color appeared. Absorbance was read at 420 nm. Transfection of MDA-MB-231 and T47D mammary carcinoma cells with ß-galactosidase using FuGENE® HD Transfection Reagent has demonstrated marked differences in the efficiency dependent on both ratio of reagent to DNA and how long after transfection gene expression assays are carried out. MDA-MB-231 cells are easily transfected, and demonstrated ß-galactosidase mRNA expression after 24 hours transfection with all ratios tested (Figure 1a). 24 hours after transfection, ß-galactosidase activity levels above background were seen in those cells transfected at 5:2 and 6:2 ratios (Figure 2a). This ß-galactosidase activity was maintained 48 hours after transfection, with the highest levels seen in 6:2 samples (Figure 2b).Despite T47D cells being known as hard to transfect,ß-galactosidase mRNA expression was seen in all samples 24 hours after transfection (Figure 1b), although at this time point this did not translate into ß-galactosidase enzyme activity (Figure 2a). By 48 hours ß-galactosidase activity was seen in samples transfected with 4:2, 5:2, and 6:2 reagent to DNA ratios, at levels higher than or equivalent to that of MDA-MB-231 cells in the case of 4:2 and 5:2 (Figure 2b). No toxicity was seen in either cell line after transfection. 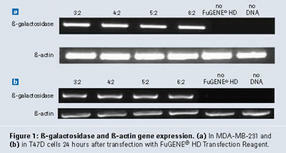 For both cell lines, higher ratios of FuGENE® HD Transfection Reagent to DNA gave the best transfection results. The primary difference in transfecting these two cell lines appears to be the length of time after transfection that functional transfected gene expression is evident. That is, for MDA-MB-231 cells, assays can be performed from 24 hours post transfection, whereas for T47D cells it is be advisable to wait until 48 hours post transfection to perform functional assays or to begin selection for stable cell line establishment. Using ß-galactosidase as a reporter gene, FuGENE® HD Transfection Reagent has demonstrated positive results in the transfection of both MDA-MB-231 and T47D mammary carcinoma cells. The results of this optimization experiment have demonstrated that the hard-to-transfect T47D cell line can be transfected with FuGENE® HD Transfection Reagent following the manufacturer’s instructions. Subsequent to the optimization of this transfection, stable cell lines have been established in T47D cells using a 4:2 FuGENE® HD Transfection Reagent to DNA ratio and selection utilizing G418, beginning 48 hours post transfection (data not shown). The characterization of these cell lines has confirmed a high-level stable expression of the gene of interest.